Plot Summary: The Band of the Hawk participates in the Midland war campaign. On the bloody battlefield, they conquer decisive victories that lead them to Doldrey, an old fortress that will decide the outcome of the war. 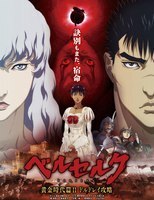 Amid all this carnage, Griffith´s words still resonate in Guts´ head and make him wonder what should he do once this conflict is over.